From Acadia in Maine to the volcanoes of Hawaii, America’s 59 national parks are breathtaking places of wild nature and sweeping beauty. They’re places that should be celebrated every day, but 2016 gives us a special moment to honor the parks and the people who look after them. This year marks the 100th anniversary of the National Parks Service (NPS). The federal agency was created by President Woodrow Wilson on August 25, 1916, to protect and preserve America’s natural and historic heritage. Back then, there were only a handful of national monuments, sites, and parks, and most of them were out west. Today, the NPS oversees more than 400 sites across all 50 states (and some territories). To honor the NPS centennial, the Anderson Design Group in Nashville, Tennessee, created a series of posters celebrating every national park and collected them in the new book 59 Illustrated National Parks. Written by the father and son team of Joel and Nathan Anderson, the book presents spectacular pieces of artwork alongside short essays detailing the history and legacy of the parks. The process of creating a poster began by traveling to a national park and taking photos and doing a lot of photo research online. The goal was to distill a park down to one or two iconic images — a difficult task with a place like Yosemite, which has dozens of seminal spots. But they found help in a surprising place: selfies. “I was very curious about which of the vistas, the landmarks, the poses [people] wanted to put out there as, like, ‘I went to Yellowstone.’ Or, ‘I went to Glacier,’” Joel says. ​Once the Andersons had their source material, the team of artists with the group began hand illustrating the posters. From start to finish, they took 30-50 hours to create. Another artist, Kai Carpenter, painted his pieces, which took 50-60 hours. Regardless of the medium, the unifying quality of the posters is that they all look old. And that’s on purpose. For the Andersons, this series is all about creating a connection between the past and the future; memories you’ve already made and memories you want to make. 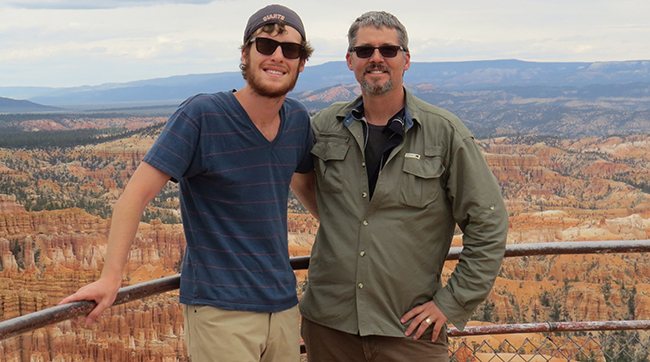 When creating the series, Joel and Nathan drew heavily on their shared experiences in national parks. Whether it was a family road trip in an RV to the Grand Canyon, Zion, Bryce Canyon, and the Petrified Forest or driving through the vast peaks of Glacier National Park, the Andersons have developed a deep love — and respect — for America’s national parks. That emotional connection resonates in the artwork and the book. The posters are love letters to the parks. But they’re also a call-to-arms to keep our country’s wilderness legacy safe. The National Park Service have looked after these places for 100 years. And while we might not all be rangers, it’s our duty as citizens to be guardians of the parks, too. 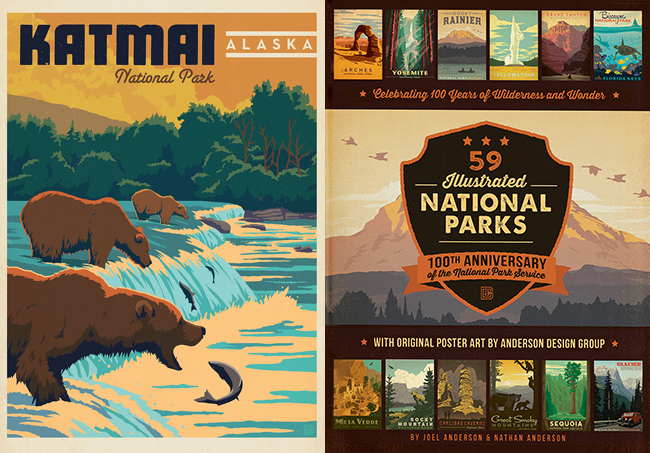 To mark the 100th anniversary of the National Park Service, father and son team Joel Anderson and Nathan Anderson collaborated on a book of travel-poster art created by the Anderson Design Group that celebrates the 59 sites designated as National Parks. Here's a sample of those posters to get you excited about the natural beauty found all over America.